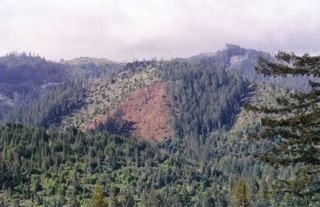 THPBlog: Humboldt Redwood Company to log on steep and unstable slopes south of Scotia, CA. Humboldt Redwood Company to log on steep and unstable slopes south of Scotia, CA. This THP is about 3 miles south of Scotia, CA near Highway 101 at an elevation of 820 to 2,700 feet. The THP area flows into the Eel River which is listed as impaired for sediment and temperature. Humboldt Redwood Company is planning a tractor and cable logging operation on steep and unstable slopes in redwood, Douglas fir and grand fir forests. There are over 60 mapped landslide areas including debris slides, earth flows and disrupted ground within the THP area, and several misc road failure sites; including 1 major road failure site that failed in 2012 and was re-built. Logging is also proposed on 6 acres of old growth within stands 330C and 589D. Humboldt Redwood Company wants to use ground based equipment in areas designated for cable logging. 26 road drainage sites are planned for work including rocking, dip construction, culvert repair/replacement and road bed stabilization. There is a marbled murrelet stand near a haul road, and a sharp shinned hawk nest inside unit 1. More information is available on the THP Tracking Center website.